This post was long overdue till I thought I have posted it last year....but, here goes. Do any of you have problems with black- or whiteheads?? When I really really cannot stand it, I would just squeeze them, after I have cleansed my face. That's when I regret my "squeezing actions", but...oh well. 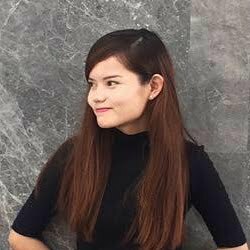 I have tried nose strips by Biore. They don't work that "wow" for me so I searched on. This time I tried the Holika Holika Pig-nose Clear Blackhead 3-Step Kit. My very first time in buying the brand and also such cute packaging to treat my nose/pore problem. Yes, I cannot deny. I am a sucker for cute packaging and also when I see the product running out in a shop. It is as if the product was "meant to be purchased by me!" Lol. That's what I always tell myself. On that particular noon in Hong Kong, we witnessed a consumer asking for the seller if she still had this Holika Holika Pig-nose Clear Blackhead 3-Step Kit. Seller: "I only have less than 4 left." Consumer: "I;ll take the remaining. When will the stock arrive?" So, without hesitation, I got 1 piece to try out (but I did not try it before I bought the other 9, big sister tried it than can already) and another 9 pieces the following day. Unfortunately, a few weeks back, big sister was telling us how ineffective it was. I was seriously discouraged in using it for the second time (I have tried the first time but forgot to wet my nose for the second step so it wasn't that accurate). Please shoo, whiteheads and black-! Step #1 : Apply 15-20 minutes. Helps to open up pore. This first step stings my nose a bit. Probably it really does help open my pores. Step #2 : Wet the nose area. 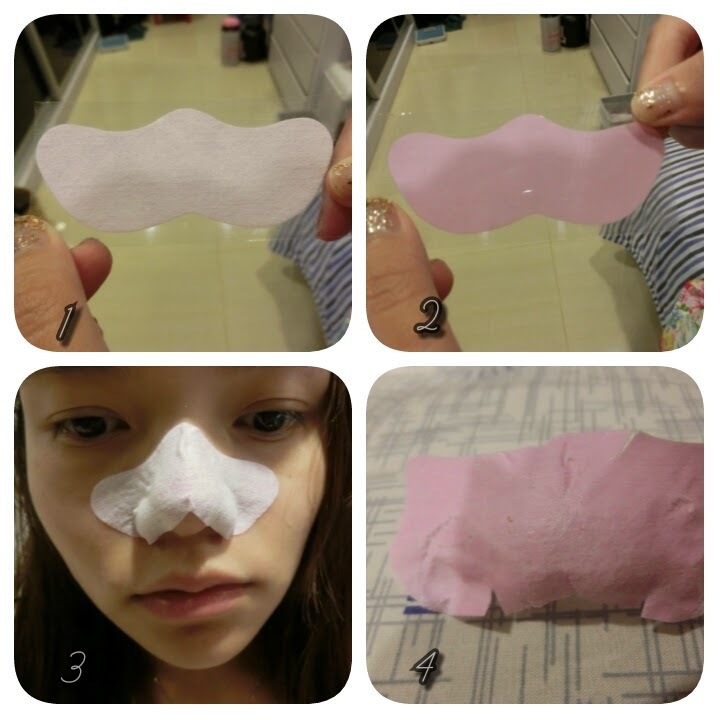 Peel off the transparent film and stick the non-cloth darker pink layer to your nose for 10-15 minutes. Number 1 and 2 shows the two sides of the nose patch of step 2. Stick the side of number two to your nose after you have wet your nose. Aft error 10-15 minutes you can peel the patch and see if there is anything on your patch. Step #3 : Close pores. Apply a rough 5 minutes will do. There are three layers in this step as seen in image "2". Only apply this hydrogel layer in the middle layers to your nose. It is slippery so it "kacau-ed" me when I was hurrying to apply it on my nose and play Dota with my siblings. So I think one is to better relax while applying any type of masks. #2 - not much whiteheads were extracted. no blackheads at all. maybe I do not have that much to be extracted? Pain level not that much for me because I think that the pore pack are much more painful. Does less pain means less efficient when cleaning my pores ? ? 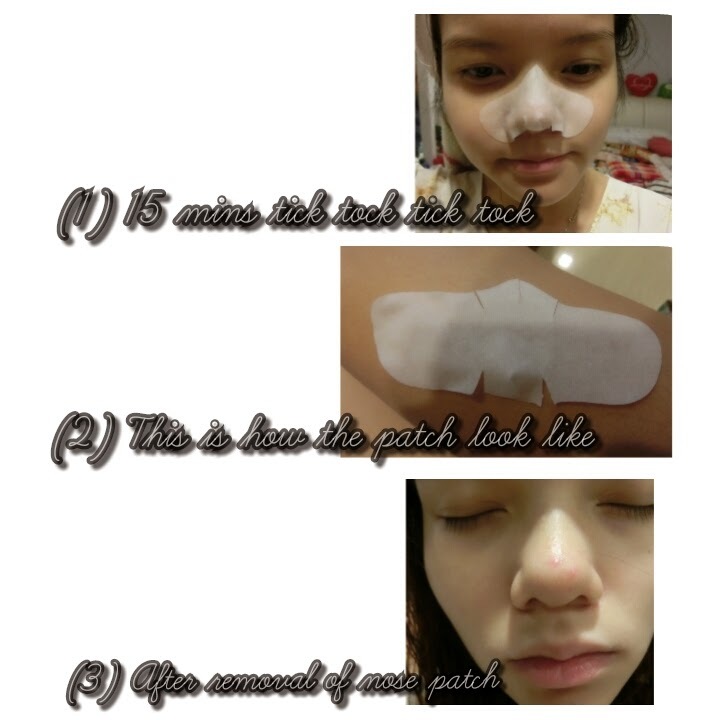 #3 - nose were oily slightly but not oily anymore after dry, leaving smooth nose. I cannot be sure if my pores were really closed. Lol. #1 - smells citrus like lemon. No. But I failed to continue my serum and all as I read her (my big sister) review (here) saying it is sticky and all so while I waited it to dry and play Dota with siblings, I totally forgot to follow up with my skincare routine. So I find that this nose mask is not that user friendly, for me. - did not extracted as much as compared to first use. No. Cons outweighs the pros. In case, if you have missed my HK FAMILY TRIP, click here for the food and fun stuff that I have experienced with my family.